You'll explore the less-touristy side of things at Lobkowicz Palace and Cathedral of St. Barbara. Get some historical perspective at Prague Astronomical Clock and St. Vitus Cathedral. 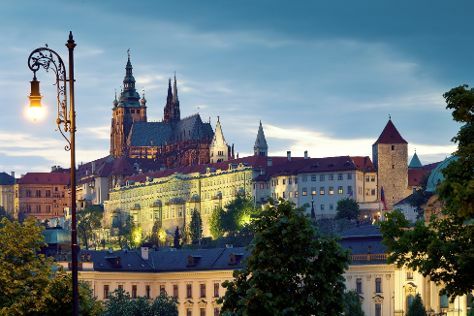 Get out of town with these interesting Prague side-trips: Kutna Hora (Saint Barbara's Church & Ossuary / The Cemetery Church), Terezin Memorial (in Terezin) and Karlstejn Castle (in Karlstejn). There's still lots to do: get a taste of the local shopping with DOX Centre for Contemporary Art, take in the exciting artwork at Parfumerie EGOIST ROYAL PARFUMS, get to know the fascinating history of Prague Castle, and stop by ARTĚL CONCEPT STORE. To see other places to visit, more things to do, and other tourist information, use the Prague itinerary maker. If you are flying in from Canada, the closest major airports are Václav Havel Airport Prague, Karlovy Vary International Airport and Brno-Tuřany Airport. In September, daily temperatures in Prague can reach 21°C, while at night they dip to 11°C. Finish your sightseeing early on the 23rd (Sat) so you can travel back home.